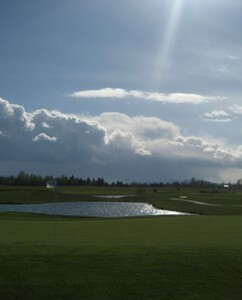 North Bellingham doesn’t look much like other Bellingham courses. As you approach the clubhouse from Smith Road you perceive a rather Spartan landscape and one you’d never associate with the Pacific Northwest. 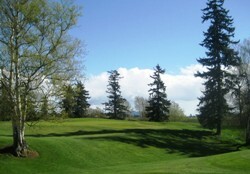 100ft pines do not line the fairways at North Bellingham. In fact, inside the course's perimeter, there’s barely a tree in sight. The ground is no less suitable for golf, however. Here, on this barren 200 acres that form part of the old Wilder Cattle Ranch, you actually find a splendid course that makes excellent use of what movement there is in the ground and richly deserves the four stars Golf Digest has awarded it. The course was developed, and is still owned, by the Caitac USA Corporation, a Bellingham company specializing in property management. It opened in 1995 and was designed by Delta, BC-based architect Ted Locke who was an associate of well-known Canadian designer Graham Cooke before he set up his own firm in 1992. As you might expect of so open a course, North Bellingham enjoys some great views – southwest toward the San Juan Islands and east toward Mt Baker – and also some strong winds which blow in mainly from the southwest and can, says Head Pro Nathan Vickers, effect virtually every hole. The course opens with a gentle Par 4, but the challenge builds rapidly as you move to the 431-yard 2nd. The 4th, considered one of the course’s best holes, requires a drive hit diagonally across a lake meaning you have to decide how much water you can carry. The 6th is an exciting Par 5, the 8th a strong Par 3 that might require a hybrid from the back tee. 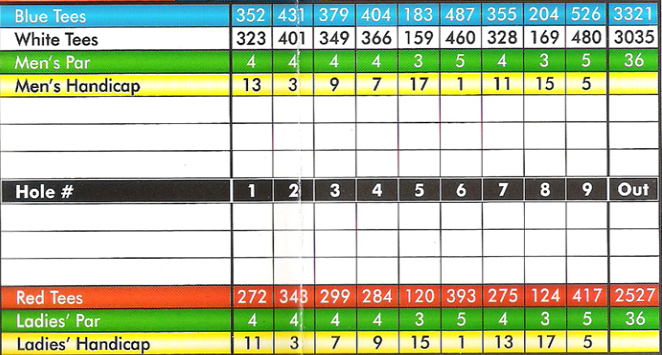 The front nine closes with a wide open Par 5 where you can open your shoulders. ‘I aim left off the tee, and just hit it as far as I can,’ says Vickers. The back nine is full of quality holes, none better than the 564-yard Par 5 11th which plays toward a triangular-shaped green protected by sand and water. The 12th, a superb short Par 4 whose green is found with a pitch across the corner of a small lake, might be most people’s favorite hole, although fans of the 425-yard 15th and strategic 513-yard 17th may take issue. The home hole is another strong Par 4 - 453 yards from the back tee – that requires two of your best to find the green. It caps a testing, but enjoyable, round of golf. It’s not often a Par 5 is considered the toughest hole on the course, but this one can be a brute especially into the prevailing wind. Water, sand and long grass threaten the misdirected drive, and water is an issue again at the green which is a problem for strong players looking to get home in two and less able golfers who might be hitting as much as a 7 or 8-iron into the green for their third. Really, unless conditions are very favorable, the hole is best played as a three-shotter, with extra care given to the third shot. 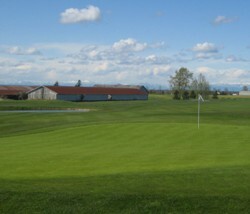 Like the 16th at Sudden Valley, the 14th at North Bellingham is a relatively safe mid-iron shot to a large, flat green. Water does lurk short and right of the putting surface, but shouldn’t really come into play. The Par 5 9th is also fairly harmless with its flat, wide fairway. It does get a little trickier up at the green, but 18-handicappers should be looking to pick up a net birdie here. The 487-yard 6th is the shortest Par 5 on the course but, because of its twists, turns, troughs, valleys, and the fact the approach is uphill, is unreachable for most. Despite its apparent lack of length, the hole is actually the #1 handicap hole which shows how teasing and bewildering it can be. That's a testament to Locke’s excellent design. The 9th and 17th are a little longer (39 and 26 yards respectively) but more straightforward holes, so are more likely to be covered in two shots. There are five Par 4s under 400 yards at North Bellingham, but none are shorter than the 352-yard 1st (323 yards from the white tees). It’s unlikely therefore, anyone will be putting for eagle at any of the two-shot holes. The tee shot at the 404-yard 4th must carry the corner of a lake – how much of it you take on determined by how confident you’re feeling. Go too straight and you risk finding one of three bunkers on the far side of the fairway. Try to avoid them by aiming left and you face a more demanding carry over the water. Aim right of it all, taking the water out of play altogether, and you'll leave yourself a daunting second shot. North Bellingham is a driver’s course. Rare is the hole where you can’t stand on the tee confident that driver is the right choice. You might opt for position over distance at the 355-yard 7th and 363-yard 12th, but otherwise feel free to reach for the firepower. The Par 5 9th is wide open. See how close you can get in two. The 526-yard 9th is the most inviting drive on the course. The fairway is pretty flat and probably 40 yards wide. Like Head Pro Nathan Vickers says, just tee it high, aim up the left and give it all you’ve got. North Bellingham could be described as barren, desolate, bleak even. But that is actually part of its appeal. In amongst the tall grass, undulations and well-placed water hazards are a number of very fine holes which, during the summer months when the flowers are out and the views of Mt Baker uninterrupted, are a joy to play. 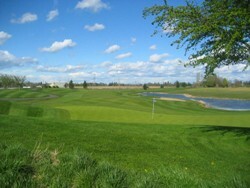 Green fees: $35 weekdays, $45 weekends.